Weldmar Hospicecare took part in Hospice Care Week, between 3rd to 9th October 2016, to raise the profile of hospice care. and we used the week to tell the story of what hospice care is in Dorset, and how it is provided. 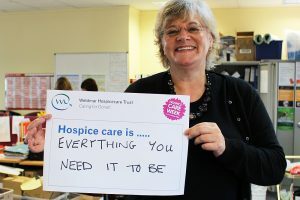 Throughout the week we shared photographs of our staff, volunteers, patients and supporters – who have used one of the posters to describe what ‘Hospice care is …’ to them. You can view a gallery of them now. We held an open day at Trimar Hospice in Weymouth on Wednesday 5th October 2016 – to coincide with Trimar’s 20th Anniversary. 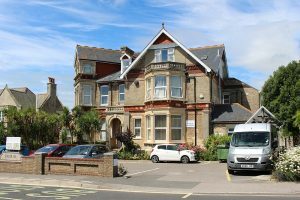 It was our a chance to show you how Weldmar supports patients and carers in Weymouth. We offered tours of the building, and the chance to meet the team and discuss the services that we offer. Members of the public and Health Care Professionals were welcome to attend and on the day we had over 50 visitors, including patients and carers, people with learning disabilities who told us it felt ‘so peaceful and calm’, and people who now want to volunteer for us. Every year, we invite you to celebrate Hospice Care Week by joining in with our wackiest event. 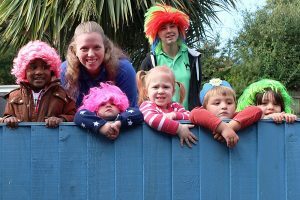 This year, Wacky Hair for Hospicecare was on Friday 7th October. You can view a gallery of some of those taking part now.